This seminal New Orleans funk group's debut album features the semi-hit "Cissy Strut" and its follow-up, "Sophisticated Sissy." This 1999 reissue also offers two previously unreleased bonus tracks, "The Look of Love" and "Soul Machine." Other highlights include "Here Comes the Meter Man," "Live Wire," and "Sehorn's Farm." One of the best instrumental funk lps around, and one of the few that hasn't been hatted on by the Strut massive. I remember finding my first copy at Junker's Heaven (r.i.p.) for 4.00. Indisputable, what would we all be without The Meters? pulled a mint copy of this early in my game at a flea for a buck. haven't seen one in the field since. i reckon they didn't press up many of these or they just weren't well distributed in the north east? Definitely deserves it's place this far up the list. Solid from front to back. I think this record sold fairly well, though the 45s probably did much better. It always surprises me how many covers of Cissy Strut there are from South American/Caribbean countries. I just pulled this out and am listening now for the first time in years. Aside from how great the music is, I've always loved the sound on these first three records. Aren't the Meters a commercial group? Didn't they start out doing tv jingles? Sorry, I just can't ride for The Meters because their tracks do not really align with what my concept of music is...except for the quite space between tracks, ofcourse that part is similar to the quite space between tracks on other records, too. i assume this is an easy 100-150 WOF staple at retail? I also really dig the cover. Understated, clever and cool. True, but the song titles mar it just a bit. WTF is your problem? I just don't like how printing the titles on the cover detracts from the overall look. Call it a pet peeve. Keep the titles on the back cover. A world without The Meters is not a world worth living in. The Meters also tend to be my go-to group when I get the inevitable "wow, look at all these records you have...play me one!" deal. Found this years ago still in the shrink in Lodi of all places. I wish they had pressed mono versions of these early LPs on Josie. Jubilee/Josie was a fairly successful label in their day, with lots of hit singles to their credit. The success of "Cissy Strut" and "Sophisticated Cissy" was good enough to push the Meters' first album into the Billboard album charts (#108 in the Billboard Top 200). So there were definitely a lot of these being pressed up. However, R&B prior to 1976 was more singles-oriented than album-oriented, so of course the 45s will turn up more often. Hell. Jubilee/Josie was more singles-oriented themselves. Agreed. 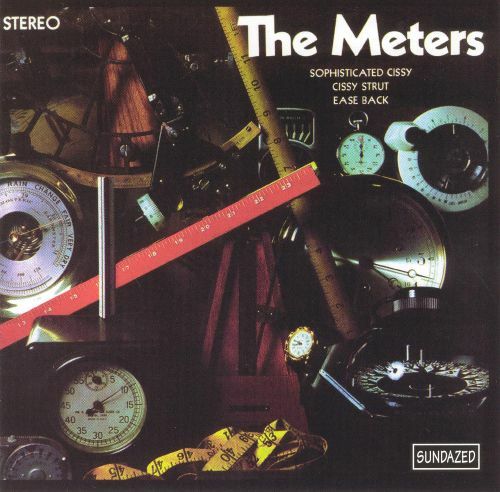 Literal cover art can get really tacky, but the austerity of those actual meters on the cover is tastefully done. thats an interesting point harvey about the tuba influence... makes sense. Gramps lived in Lodi. Years later I would still go out there to the pumpkin patches and wineries just for nostalgia sake but would hit up some of the antique stores, never with any luck except for that one time. My girl was with me that day, she's frequently been my good luck charm. I'm a troll who does not listen to funk. Heck, I've never even heard of the Meters. You're one of my trolls.